…you always remember the first time. First time your quilt is published in a national magazine! 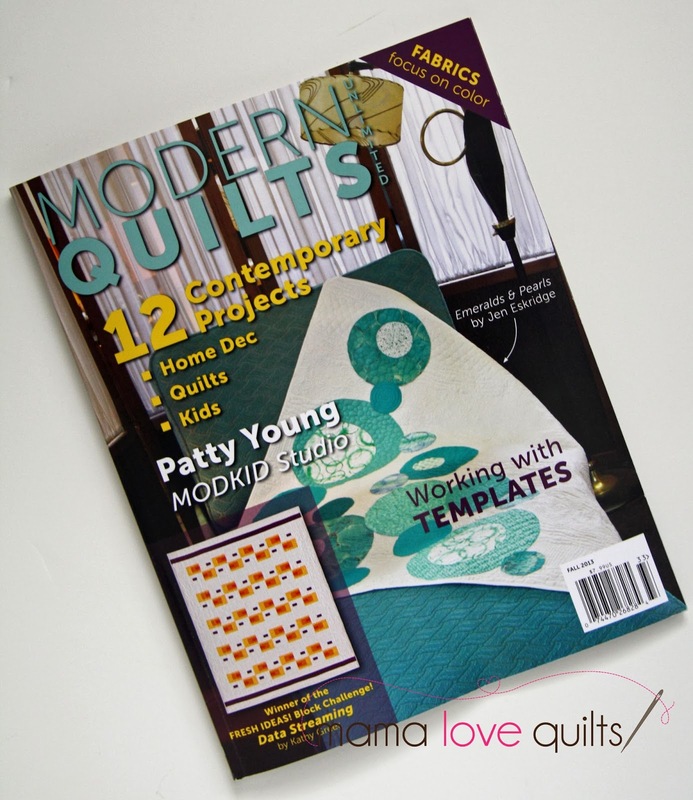 I came home yesterday to find the Fall 2013 issue of Modern Quilts Unlimited in my mailbox waiting for me. Inside was this little baby. Her name is Jagged Stars. I made her earlier this year and shipped her off to the MQU folks. It looks like they took good care of her and gave her a nice sofa for her photo shoot. When MQU accepted my quilt, I knew the day was coming that I would see it in print. Now that day is here, I’m humbled to see my handiwork dolled up on the glossy page. It is a first I won’t forget. Congratulations! Your work is so impressive, I am sure this will be the first of many! Can't wait to get my copy of the magazine in the mail! Congratulations. I can't wait to get my copy in the mail. Wow, that is just wonderful. Congratulations! I am so pleased for you. And I love your quilt too. Fantastic!!! Well done you. If we got that magazine here I would rush to by a copy. I figure you can never have too many star quilts! Congrats! What a thrill for you! A beautiful quilt. I've never seen this magazine in the UK!! Your quilt is lovely. Congratulations. Congratulations!! That is so exciting. Jagged Stars is beautiful and looks right at home in that glossy photo! That's wonderful; congratulations! That is my FAVORITE quilting magazine, ever, and I can hardly wait to get my copy, too! Congratulations!! So well deserved that your creations are published. I really enjoy following your blog and looking at all of the wonderful quilts you create. Hopefully I can find a copy in Australia. Congratulations! I do think it would be super fun to publish a pattern (and I don't even write patterns!). You should do a blog post on what the process of submitting to magazines is like! Very cool!! And I can always say "I knew her when…" ;-). So pleased for you! Fabulous quilt. Congratulations. You rock! Just wanted to stop by and say congrats! Lovely quilt by the way too! How exciting!!!! I so enjoy following your blog and this is a quilt I would love to try! Congratualtions! Yay, Nicole! I see your online-published pattern was only the beginning – now you're on paper, too! So happy for you. Yay!!! Congratulations Nicole!! Gorgeous quilt. I'll have to see if I can get a copy over here. Congratulations. Having something published is truly a great feeling and well deserved. Your quilt is wonderful. Congrats! You do amazing work and it's no surprise something of yours has been published. Your work is amazing and beautiful! Enjoy the spotlight it is well deserved! Congratulations, Nicole! I think I've loved every quilt you've ever made, so I think this is an honor richly deserved! Congratulations my friend! Well deserved-it's beautiful! Congratulations! She is beautiful and although she is your first, I am sure it won't be the last publication of your wonderful work! This is wonderful! Well done!